When you have to keep it clean, nothing does the job better than Ultimate Washer high-pressure cleaning hose for water cleanup applications in variety of power washing jobs. Depending on your need, our durable, reliable hose line handles pressures up to 5000 PSI, temperatures up to 300 °F, and can be used with hot or cold water, and mild detergents. All extensions come equipped with bend restrictors on both ends. Reduced outside diameter (OD) makes hoses lighter to use but at the same time they maintain strength and flexibility. 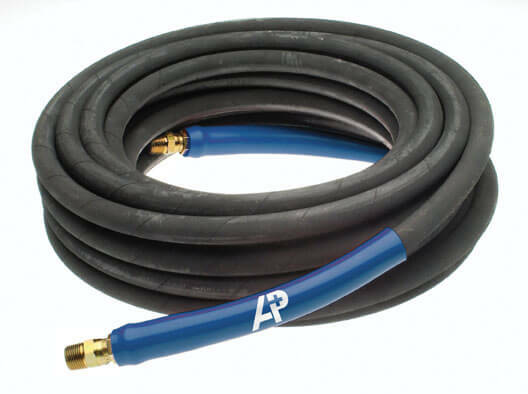 High Pressure Washer Hose - For High PSI Level and Any Cleaning Job! These hoses have a working pressure of 4000 PSI to 5000 PSI and are oil resistant with a no-mark cover. They are ideal where they come in contact with cleaning solutions used in the pressure washer industry. NON-MARKING pressure hose gives your power washing equipment more professional appearance. Close up look of the quick connects attached to the pressure washer hose. * Hoses include quick couplers (not depicted in image). Note: Not recommended for steam service. 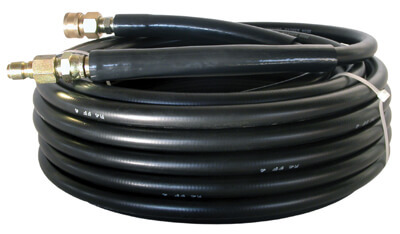 Jumper / connecting hoses are mostly used for pressure washing and they are used to connect the pressure washer with the hose reel or water tank. These are single high-tensile steel wire braid hose equipped with high temperature bend restrictors on both ends. It has a seamless inner tube and a oil cover. Can be used as pressure hose (max 3000 PSI & 250 °F) or as a steam hose (max 350 PSI & 325 °F). 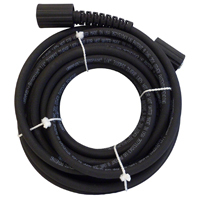 Super abrasive-resistant cover hose for use with hot or cold water pressure washers. Please make sure to select the correct fittings to fit your pressure washer. 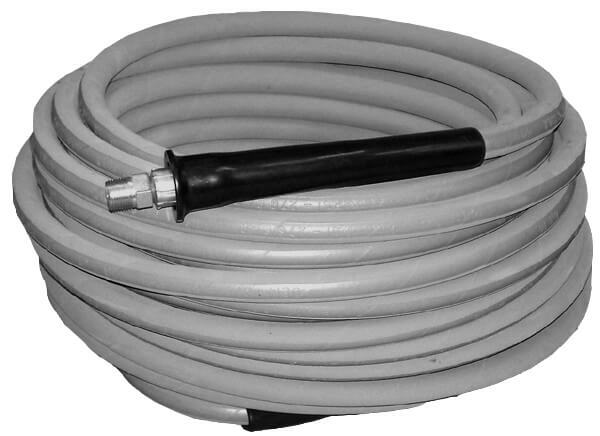 Replacement hose for most hobby pressure washers sold by mass retailers. Top quality molded fit bend restrictors. Fits snugly to prevent kinks near the connectors. Design and build your own hose or adapt and repair hose in the field (no crimper required). Add trigger gun and wand assembly to your pressure washer that will give you extra cleaning ability where it extends the range to hard to reach areas.